of the gallery and is a beautiful cathedral-like space. he gives you a sense of the scale. Magnificent. live here. Make sure to see it when you come to town. You are adorable!I have no doubt that your desire in showing there will be realized. The space is awesome. I'm very curious of this larger scale work you have been eluding to...very exciting. Have you stopped by lately to see Karen Appleton's 48x48s? Amazing. 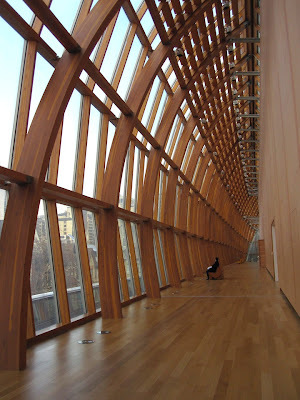 I love the AGO! I think I have a photo of myself in the very same place. Someday we will go there together! What an incredible place. Yes, I agree Frank Gehry is incredibly talented. You know, you have a strong talent. I'm dreaming right along with you. Yes it is. I hope you come to Toronto some day to see it. Thank you. I hope we show there someday together. I realized that part of my blogging problem was my Internet speed (being fixed now I hope). Thanks. It would be great one day to have a show of art bloggers in a great museum. Your support means a lot to me. You have already shown in a major museum. You are the big time. Sorry I missed you there. There are about 100 things going on in my house at once. I know you understand. You were the inspiration for those photos. I loved your shots, and wanted to do the same thing. I hope our thoughts create our future. That would be awesome.